Interview with Dr Kwasniewski on “Beauty—God’s Messenger” — Latin Liturgy Association, Inc.
NLM readers may wish to know about a new magazine, Calx Mariae, published four times a year by Voice of the Family in the U.K. The editor, Maria Madise, invited me to do an interview on the theme of “Beauty—God’s Messenger,” for the third issue, which recently appeared in print. I hope I am allowed to say, in spite of being a contributor myself, that I find the content and the production values extremely high. It is truly one of the nicest publications I’ve seen in a long time, and a sight for sore eyes in these days of internet-dominated news and features. 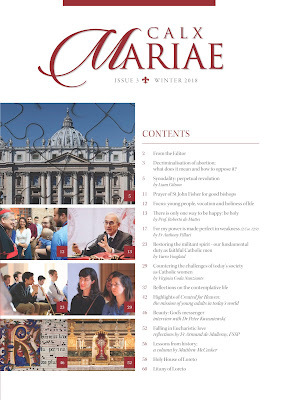 For subscriptions and copies of individual issues, visit this link. With the editor’s permission, the full interview is reproduced below. Maria Madise: Throughout history, the Church has sought out beautiful music, art, architecture and the finest craftsmanship. Why do these things play a crucial role in Catholic spirituality and formation? Peter Kwasniewski: The reason is simple: we were made by God as creatures of flesh and blood. We learn through our senses. When God revealed the Law to Moses, He made use of a lofty mountain, lightning, thunder, dark clouds, blood, and stone tablets. When He commanded the building of the tabernacle, He showed the pattern of it in fine detail, demanding the most expensive materials. When God spoke to Elijah, He first made a lot of noise, and then revealed Himself in a “soft, small voice.” When Our Lord wished to give Himself most intimately to His disciples, He used bread and wine, in the midst of a highly structured religious ritual. We can think of thousands of examples from divine revelation of “theophanies,” that is, the manifestation of God in various signs and figures. The Jewish liturgy in temple and synagogue continued this pattern, and obviously Christian liturgy did as well, moved above all by the miracle of the Son of God Himself taking on flesh and blood. The Catholic Faith, with the power of the Incarnation behind it, developed the richest and most beautiful culture the world has ever known—but all in the service of pointing beyond itself, to God. What is the purpose of beauty? Is it practical or functional? Beauty is God’s first, last, and most effective messenger. We learn that the world is good and orderly because of the beauty of nature, which we only later come to understand intellectually. And just as we come to know God through His divine artistry, we see the inner beauty of the human person most of all in the great works of human art. A painter like Rembrandt helps us to see the immense, almost heartbreaking beauty of an old man or old woman’s face, which we might otherwise rush past or even find ugly. Christ Himself is “the fairest of the sons of men,” as Scripture says, but He allowed Himself to become “a man of sorrows,” marred beyond belief, to tell us something unforgettable about the invisible Beauty of love, of sacrifice for love. The Church therefore cannot and must not flee from her role of introducing mankind to this immortal Lover, both in the beauties that appeal to our senses, and in the deeper mystery that no sense can reach. 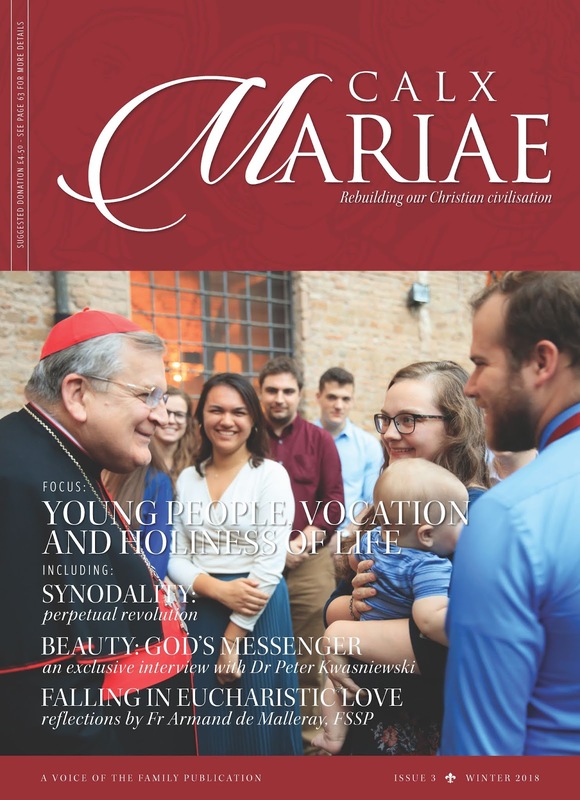 What is the role of beauty in the formation of children and young people? The first thing a baby notices in the world is his mother’s face, which establishes a first and permanent vision of beauty—not necessarily as the world sees it, but because love discloses the truth. 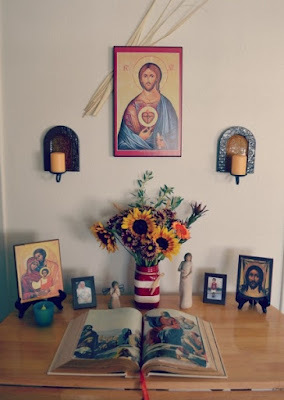 As a child grows in the family, his parents have the serious obligation to train him or her in a love of the beautiful by reading good stories, memorizing poetry, putting up good artwork, making art together, and attending liturgy that is outwardly very beautiful, if at all possible. All these things are part of a subtle and pervasive education of taste, sensibility, instinct, and intuition. When we are brought up with beauty, we have a sense of propriety, respect, nobility, dignity. These things are proto-religious or para-religious attitudes that heavily influence the course of one’s life. Without them, we are much more vulnerable to the winds of false doctrine and shoddy excuses. How would you explain to someone what exactly culture is and what is Catholic culture? It is not easy to define culture. In a recent lecture I tried my hand at it: culture is “the shared ways in which a society or people is accustomed to expressing, celebrating, and inculcating its vision of reality.” Maybe that’s too broad. Culture is always concerned with the concrete expression of ideas and values. How we eat our food, what we drink and when and why, how we dress and speak, what our buildings and vehicles look like, all this is culture, and does, in fact, express a worldview (or perhaps an eclectic mingling of worldviews). A Catholic culture, then, is what a society inspired by the Faith will produce and cherish: an environment that turns the mind to God gently and frequently, making full use of the high beauties of fine art and the rugged genius of folk art, the impressive pageantry of ceremonial and the stabilizing force of rituals. The result is a joyful impregnation of the whole of life with the immense reality of God, too great to be limited to any domain or any one expression. Should there be an overlap in liturgical and popular culture? If yes, in what form? If no, why not? I think, in fact, it has been a tragedy that high culture and popular culture have parted ways almost completely, and that the liturgy is no longer the driving force of culture, as it had been for well over a thousand years. Today’s “inculturation” is often cheap, random, and secular, because it is not guided by strong and clear thinking rooted in divine revelation and Church tradition. For example, people try to take contemporary pop music and bring it into the liturgy. This is a giant mistake, because this music is saturated with emotionalism, strongly associated with the liberal anti-culture and its sexual promiscuity. It does exactly the opposite of what church music is supposed to do: raise the mind up to God, purify the heart of disordered affection, discipline the body. Instead of assisting in our assimilation of the Word of God, it rather promotes the secularization of religion. What is our duty as the heirs of Catholic tradition? Do we need to reform, preserve, or recreate? This is an important question. 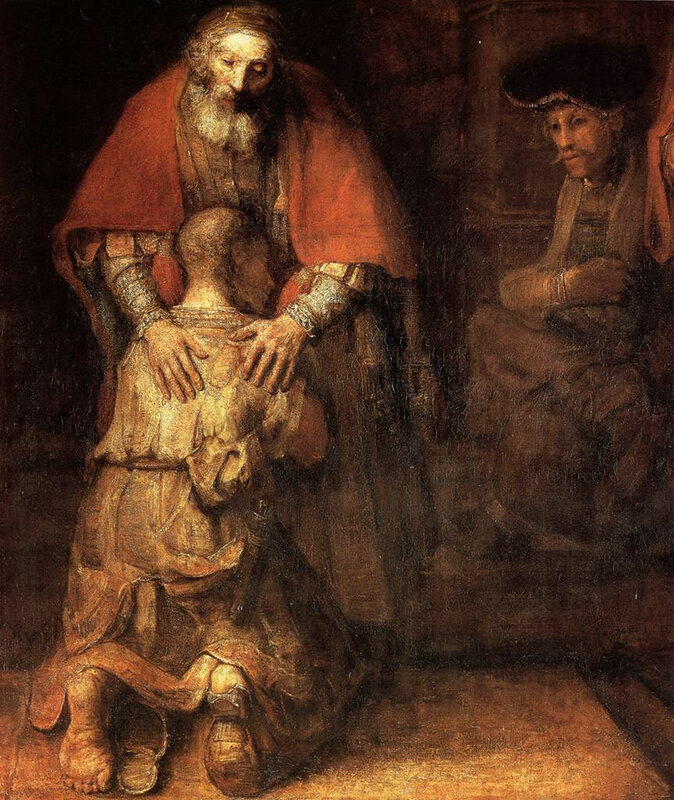 Here is what Our Lord Himself teaches us in the parable of the prodigal son. What we do to, or with, our family inheritance shows what we think of our father and of our entire family. Now, no one can deny that things like Latin, Gregorian chant, and offering Mass ad orientem are central, constitutive, and characteristic treasures of our Catholic patrimony. The liturgical reform suppressed them or marginalized them, acting just like the prodigal son who squandered his family wealth on loose living and ended up impoverished and miserable. The only way out of this bad situation is what the parable shows: conversion, repentance, return, and reestablishment in the house of the father. The right attitude towards our inheritance is to protect it, preserve it, defend it, and make use of it to the greatest extent possible. To do this, we must know it, and the better we come to know it, the more we will love it. This love, in turn, will inspire new works of beauty in continuity with what has come before. That is the experience of every serious Catholic artist—architect, painter, iconographer, sculptor, composer, poet. Knowing our tradition, we imitate it, emulate it, develop it, and carry it forward into the 21st century. There is no need to seek originality. The only fully original person is God the Father, since He has no origin from anyone else; even the Son is not original, but originated; and the Holy Spirit from the Father and the Son. God Himself teaches us that the perfection of all persons after the Father consists in their derivation from another. The creature who tried to be wholly original was Lucifer, of whom Our Lord says that he is “the father of lies” because he “speaks from himself.” That’s where sheer originality will get you: into hell. And that, of course, is what we see in so many modern artists. Incidentally, Martin Mosebach has made the observation that the notion of reform makes sense only if one takes the word itself seriously: it is a return to form, a re-forming of that which has lost good form. Reform doesn’t mean loosening up, wandering off, or blowing things up. It means more discipline, more attachment to good models, more self-control, more humility in the service of greatness. That’s the kind of reform that the Church always needs, not the “reform” we have gotten in the past half-century, which should more truthfully be called deformation. How would you describe your own discovery of Catholic tradition and what effect did it have on your formation and work? For me, the discovery of Gregorian chant was a huge revelation. I can’t say why I was so fascinated by it at the tender age of 17, but then again, the chant really is mesmerizing and haunting in a way that no other music is. By listening to recordings of the Wiener Hofburgkapelle, I taught myself to read the neumes in an old Graduale Romanum that had been discarded by the Benedictine boys’ school I was attending at the time. I think my study of composition—being introduced to J. S. Bach’s chorales and trying to imitate them in my exercises—also played a role: there is something about this kind of discipline that helps the mind to perceive beauty not as something vague, fluffy, and sentimental, but as the result of labor, craft, rule. Attending TAC introduced me to a world of immense depth and beauty. This included the traditional Latin Mass, where all that is purest, loftiest, and loveliest in the Catholic Faith comes to roost. I think of that psalm verse: “Even the sparrow finds herself a home, and the swallow a nest for herself, where she may lay her young: Thy altars, O Lord of hosts, my King and my God” (Ps 83:4 [84:3]). The Mass truly was and must once again become the inspiring force of Catholic culture. Certainly for me and my family, it has been the place where we can make a spiritual home, and where we may bring up our young in the peace and fragrance of Christ. So much of modern culture is ugly, even grotesque, many people have a real hunger for what is beautiful and good. Can you suggest how we may satisfy this hunger? I strongly believe, as I hinted earlier, that we need to surround ourselves with beauty. I don’t mean in a cluttered or kitschy way, but by suitable decorations, by investing if we can in works of art, by listening to really good music (and by this, I do not mean any particular period, but certainly not pop, rock, rap, techno, or any of that barbaric stuff, which is the musical equivalent of junk food or drugs), and by seeking to understand the greatest art that European and Catholic civilization has bequeathed to us. I would recommend several practical steps. First, find the most beautiful celebration of the liturgy you can, and go to it. If it’s in a beautiful church, even better! The liturgy is where most of the fine arts blossomed and where they are meant to be experienced: as offerings to God, caught up in (and ideally assisting in) the ascending movement of prayer. The liturgy is not just the “source and summit” of the Christian life, it is also—or it has been and should once again be—the source and summit of Christian culture as well. Fifth, make time for ongoing education. I cannot recommend highly enough the lectures by art historian William Kloss available from The Great Courses: such eye-opening and fascinating explorations of the genius of the greatest artists, who have a special gift for seeing—and thus, for helping us to see—the luminous depths of reality. Obviously, if one can visit a good or great museum, one should do this on a fairly regular basis. Sixth, at least once a year, go on pilgrimage. The pilgrim, too, gets to enjoy the sights and sounds of the journey and the destination, but he has a higher purpose than the mere tourist. Aesthetic experience becomes more meaningful when united to the love of God, the practice of religion, and the expression of devotion to a saint and to Our Lord Himself. This is what I loved, by the way, about attending the All Souls Pontifical Requiem Mass at St. John Cantius in Chicago this past November 2nd: the choir and orchestra performed Mozart’s Requiem in its authentic liturgical context. Somehow, hearing it in the right place and at the right time made the music even better. Seventh, if we have the means, or if we are in a position to influence people of means, we should try to patronize new works of art that are truly beautiful, and if intended for the Church, truly sacred also. I admire clergy and laity who, when a special occasion is coming in the future, commission a piece of music or a painting for the occasion. Obviously, as a composer myself, I recognize that if Catholics stop asking for and expecting good art for the Church, good artists will starve and disappear. The same can be said of supporting music programs and the right kind of church restorations (often undoing the damage wrought by postconciliar iconoclasts). In your new book Tradition and Sanity you make a number of compelling arguments in favour of returning to the traditional liturgy—not for liturgical or aesthetic reasons alone, but also because the way we live the Sacrifice of the Mass lies at the heart of every aspect of our lives. Could you explain this a little? In keeping with what I was saying earlier about how a grateful son should approach his father’s house and his family patrimony, I would say that worshiping God with the Roman Catholic liturgy in the form in which it organically developed for a period of over 1,500 years is crucial to having (or, for many, to recovering) a stable identity, a profound spirituality, a sound doctrinal foundation, and a compass for the moral life—this, in addition to the obvious literary and artistic merits that the old liturgy has in itself and has inspired for so many centuries. Given that Catholicism is inherently a religion of tradition, it should strike us as quite troubling that Catholics of today pray in a manner terribly different from, and even at odds with, how our ancestors prayed, including the vast majority of saints. Either they were wrong and we are the enlightened ones—or, rather more likely, we have gone off the rails in our quest for modernization and need to get back on if we would reach our destination safely. Liturgy is not something that each age needs to redesign and recreate in its own image. On the contrary, the vicissitudes of history are to a large extent transcended in a still point, an immovable center, a pole star from which we can always take our bearings. You could apply to the Mass the Carthusian motto: Stat crux dum volvitur orbis, “the Cross is steady while the world is turning.” This, to my mind, is the reason why the old liturgy is winning so many “converts” today. The world is turning at a mad pace, careening out of control, and unfortunately, because of the conciliar prejudice for aggiornamento, the world has pulled the postconciliar liturgy in its wake, like a moon orbiting a planet. The classic Roman liturgy abides in its grandeur, and seems, perhaps not too surprisingly, more “relevant” to us today than something devised by a committee in the 1960s. My book goes into all this, but also into the crisis in the papacy and in evangelization, which I believe are linked with this tragic decision to “re-orient” Catholicism along new lines. This has led not to renewal but to accelerating deformation and irrelevance. Thanks be to God, we see a countermovement gaining strength across the world, and characterized by its opposition, point for point, to the official program. That will be the drama of the next decades: how this massive “civil war” inside the Church plays out under the hand of Divine Providence.